Welcome to Episode 2 of our brand-new series, Talk Digital to Me! Here today is Convince & Convert’s own Managing Editor, Jess Ostroff. As Managing Editor, Jess masterminds Convince & Convert’s major content channels, which include its podcasts, email newsletters, and the blog. She’s a lover of efficiency, which helps her maintain Convince & Convert’s high level of quality and consistency while keeping the editorial process running smoothly. In this episode, Jess breaks down how to build an audience for your content, how to hold yourself accountable to your editorial calendar, and her favorite content management tools. She’ll also explore the dangers of “content for content’s sake” and the importance of joining your audience in the channels they frequent most. Watch the video for an inside look at the editorial machine behind Convince & Convert! Kate Volman: Hello, everyone and welcome to Talk Digital to Me, conversations on marketing and customer service with the pros over at Convince & Convert. I am Kate Volman and during every episode, I have the opportunity to interview one of the awesome team members over at Convince & Convert. 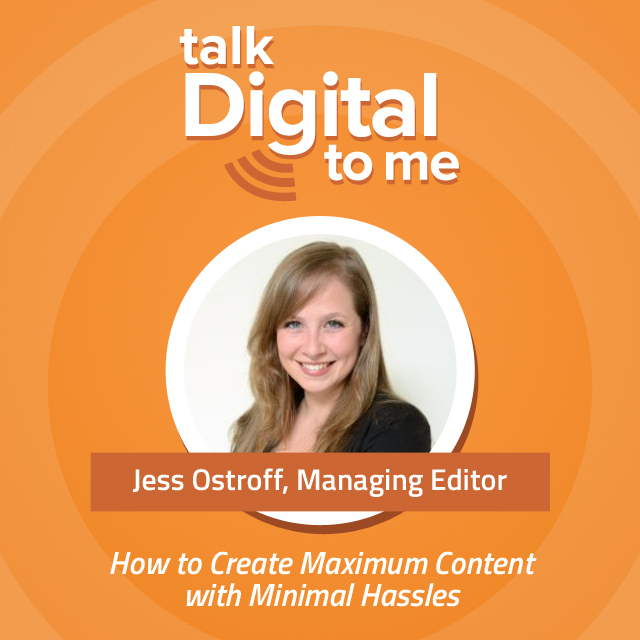 And today I am joined by the Managing Editor, Jess Ostroff and I’m so excited because the conversation today is about how to create maximum content with minimal effort. So Jess, I am super-excited about this topic. Jess Ostroff: Me too. You know, it’s something that is near and dear to my heart as a marketing person but also just as a lover of efficiency. So I’m excited to talk more about how to get people to create more content, but not just for the sake of creating more and actually creating content that will speak to their audience in a way that doesn’t drive them insane. Kate: Yes. Good point. So before we dive into the topic, why don’t you just share with everyone what your role is at Convince & Convert. Jess: Sure. I’m excited to talk about this because not everybody knows all of what Convince & Convert does. A lot of people know Jay. He’s very public in what he does. He’s out there writing books, doing speeches, writing on the blog. He’s basically everywhere, which is really exciting. And then there’s the consulting team, who focuses on a lot of the projects that we do on a strategic planning and consulting front and then there’s the media side, which is really where Convince & Convert started. Convince & Convert basically started as a blog. Jay was writing four days a week all by himself for a while and then at some point it was 2009 or 2010 he brought me on as a virtual assistant and I helped him with a lot of his travel booking, research for blog posts, things like that. My role has really evolved over the years. Now I am the Managing Editor at Convince & Convert Media, which includes all of our blogs, which we publish between eight and ten blog posts per week, plus all of our podcast production. We now have, it’s hard for me to even keep track, this might be our seventh podcast that we have. We’re going to turn this series into an audio podcast as well. And finally, it includes our daily email newsletter. So, anything under the umbrella of content we will put out, we have SlideShares and eBooks and things like that. We’re working more on that big content front. For now, a lot of the focus is on the blog, the email, the podcast production, and that’s my realm. So it’s a lot. Kate: It is a lot. In fact, it’s funny. Now that I’m getting to know you and your team, it’s been fun to kind of learn and see all the different roles that you have because I know watching Jay just online at Convince & Convert, I’m like, “How did they produce all this content?” It’s crazy. It’s all over the place. So I’m excited to talk through how to create processes for those people listening, how they can do it more effectively for their business. First, before we talk about the process, why. Why is it important for businesses today to be creating all this great content to share online? Jess: I think the biggest reason why content has become so important is because people are able to have all of the information that they could have ever wanted at their fingertips literally with their mobile phones and of course at their computers. But the way that customers are choosing where to go and what to purchase and who to talk to and how to make decisions is all through their own research right now, which it wasn’t always that way. People would talk to their friends, and that’s still the case, of course. But there’s more available online than there ever was before. There are some statistics about this, something like 50-to-90% of the decision making is done before a customer even engages with your company, which means that they’ve kind of formed their own opinions about you based on what your online content and online presence is all about. That’s a little scary because on some level, you can’t control everything that’s out there and everything that’s being said about you. But on another level, you should strive to. So whatever you can do to be putting the content that you want out there and making sure you’re managing your customers expectations and your customers complaints and cheers, as Jay talks about in “Hug Your Haters.” As much as you can do to be putting content out there that’s addressing the things that your customers want and need to know about, that’s why it’s so important now, so that you can drive the conversation as opposed to the other way around. Kate: Right. So for those companies out there that are working on a content marketing strategy, how can they come up with more creative ways to generate more pieces of content, whether it’s blog posts or videos or whatever it is, how can they figure out ways or put those processes in place that’s going to help them create content consistently? Jess: Yeah. So I struggle with this a little bit because more is not always better when it comes to content. When it comes to pizza, maybe, but content not necessarily. So you really have to think about what your customers are going to want, what format they’re going to want that in and that might mean… there are a couple of different ways to find that out. One of the ways is to do the research on your target audience and your demographics and figure out where they’re already hanging out and create the content for that platform or that channel. And then for him himself, he just does that. When Facebook Live video came out, he was right on that. Even thinking about years ago when he started the Social Pros Podcast, podcasting had been around for a while but it was kind of seeing a resurgence in 2011-2012 when we started Social Pros. He said, “I really want to make a podcast. Can you go figure this out?” I said, “Sure.” It’s kind of trial by fire at some point. I think if that show hadn’t picked up any steam, we might have said, “Maybe our efforts are better spent in other places.” But figuring out where your audiences or where your potential audiences are and finding ways to reach them in new ways and then just seeing how it goes and testing and figuring different things you can do in each platform that’s going to really make your audience. I think the whole point is really for them to get to know you better and get to trust you through the ideas that you have and the things that you say. Kate: For someone that’s watching and saying, “I’m posting on Facebook,” like maybe they just picked the one or two platforms that work for them and posting and they’re not really seeing engagement. What ideas do you have around how long should you be doing something to see if it’s actually going to gain traction and build and see if it’s going to work or do you give up? Where does that come into play? But at some point he just kept going because he had things to say. I think that the platforms are less important than the content because if people want to hear what you have to say and want to find your content, they will no matter what platform you use. So there’s not a hard and fast rule around, “Okay, well, I did 100 Facebook posts and nobody’s seeing them, so I should just quit this.” I think it’s also more about are there other ways to reach your audience to get them to Facebook? Maybe it’s not Facebook’s fault. Maybe it’s that they don’t know that you’re there. Or maybe you’re not posting the right type of content for that channel. I think you have to try and try and be consistent for a while and then use your gut. There’s some instinct there too to see if one person is engaging and it’s your mom every time, then yeah, maybe it’s time to try something else. But don’t be afraid to come back to this too. I don’t think there’s any failure, per se. Just because we try one thing on Facebook or on Instagram or whatever and it didn’t work, doesn’t mean it can’t work down the line. So I would say that too: don’t discount a platform because it didn’t work for you once. Think about maybe at that time, it’s about timing it’s about content and it’s all about the way people’s behaviors are changing and evolving. You can be posting stuff constantly and if it’s not right for your audience, then it doesn’t matter if it’s good or not. You have to think equally about them as you think about yourself, probably more about them than you think about yourself and what your core competencies are. Kate: So for a company, how do you help someone put together the right process, put together the right team that is going to, whether they meet on a weekly basis and come up with what that content is going to look like, how can a company design something on a consistent basis to help them come up with these really great content ideas to test? Jess: Yeah. We always start with the idea. We don’t start with saying, “You have to create content.” We kind of say that by not saying it. We start with their ideas and figuring out, “Okay, what do they want to get out into the world?” And then what’s the best way to get that out. But also, we have to consider the people that we’re working with, what is their preferred way of expressing themselves because the reality is not everyone is a great writer. Not everyone is great on video. We can say, “Your audience is on Blab, so start a Blab show.” But if the CMO or whoever they’re trying to position as the thought leader is terrible on camera, it either has to be, “Get Kate Volman in here. She can help you.” Or it has to be, “Let’s think about a different avenue.” So that comes at the end. The first thing we definitely talk about is what are your goals and that has to be related to your bottom line; everyone has different goals. For a lot of people, especially small businesses, it’s all about awareness. They’re trying to get their stuff in front of more eyeballs, get more people to see who they are and more people to know who they are so they’ll then buy their product. Another thing that is common is that they just want to be in the game. They don’t necessarily need a million new customers, they will get more eyeballs by default, but they know content is important. They want to get consistent and start trying things to find out where they should be. So a lot of people are at that stage, where they’re kind of like, “I know content works. I get that. But I don’t get what is going to be right for me.” That’s kind of what we were just talking about before is that you kind of have to try things out. You have to be willing to take risks and to fail. Again, I don’t call it failure because it’s not. It might not work for this audience at this time. We start there with the ideas and the goals and what are they saying that is different from what everybody else out there is saying. Or if it’s not that different, then what is one unique thing that we can highlight. So we talk about content . . . somebody over here talked about content shock. Mark Schaefer talks a lot about that and he wrote the book on it. There’s no reason to create content for the sake of creating content. Jess: It has to be intentional and it has to be related to those goals that we were talking about. So content could mean a lot of things, which is the beauty of it. That’s why I think it’s so fun, because it’s always growing and changing. It can mean someone mentioned anchor. It could be a two-minute anchor show, a daily show or a weekly show or anything like that. It could be a blog post. It could be an eBook. It could be a Blab. It could be a Facebook post. But the idea is that you want to figure out a way to be consistent on a platform, whatever the platform is. Again, I don’t think it matters as much as knowing where your audience is and reaching them where they are. Paying attention. Some people are like, “I’m going to make my 12-month content plan,” I think that’s insane. I don’t think you can do that. You can make a generic plan and say, “I want to be doing content for the next 12 months,” but I don’t think you can say, “I’m going to write 10 blog posts a week for 12 months” because who knows? Anything can happen. This space is changing so quickly. I think you have to be flexible and you have to recognize when something is changing and when there might be another opportunity that you can jump onto. I think that’s one of the things that makes certain content and media people more successful than others because they might say, “I’ve been writing blog posts about this, but this might actually be done better as a video podcast, or this might be better as a 30-second Instagram video or a Snapchat story,” and being able to not only recognize those opportunities but harness them. That’s just the nature of digital marketing. It’s really hard to get especially bigger companies on board with that idea because they want a plan and they want to stick to it. You can only do that to a certain extent, I think. Kate: So let’s talk a little bit about using the same piece of content and creating it into something different for different platforms so that people can be a little bit more effective. So taking a video or taking a blog post or turning it into a video or 30-second Instagram… should people be doing that for each one of these pieces of content? Should you look at every one piece and decide I’m going to turn it into three different pieces and what does that look like? Jess: Okay. So I think this is an interesting question too because I think this also straddles the line between planning and being spontaneous. I think it’s good to have a generic plan of we want to create one piece of big juicy, meaty content every quarter, let’s say. That’s great. I think that’s a great goal for people to have. And then say with that piece, we’re going to make a series of five blog posts. Kate: But what would that be, though? What’s like an example of that one big juicy one? Jess: I would say for a lot of people lately it’s definitely getting more visual. Everything is getting more visual. People I’ve worked with often times want to do either an eBook that’s very graphic-heavy or a slide deck that stands on its own. So for Convince & Convert, for example, maybe it’s a speech that Jay gave that he then wants to distill down into a SlideShare that stands on its own. That doesn’t need him speaking and that’s what I mean by stands on its own. Sidebar: Sometimes I see these people post these slide decks on SlideShare and I’m like, “This means nothing to me.” Like, why did you even post this? It needs context. I need the person speaking this. Again, this all comes from the big idea. Again, I don’t think it matters what the format is. But I also don’t think you should create an hour-long video. Kate: Yeah. I was just going to say like as far as the attention span of things, are people really still downloading these big pages and pages long eBooks or is it more infographics? Jess: Some people are. That’s the thing too is that everybody’s different. Everyone consumes content differently. So I don’t think you should ever discount one format over the other without trying it. There are still a lot of these, especially these more like corporate executive types, even I’ve seen guys print eBooks (guys and gals, I’m not trying to just say guys), but print out eBooks and then they take them on the plane with them or they take them with them on a trip with them. It’s very analog. But when the content is that good, it really shouldn’t matter what format it’s in. That’s also why we recommend, Jay calls it “atomizing” content because of that. Someone might want to read that big long eBook. Somebody might want to consume it in a video podcast. Somebody might want to do an audio podcast. Some might want to do it as a Snapchat story. So that’s why I think not discounting any platform one over the other, but just trying all of them. So to go back to kind of the planning idea, let’s say it’s an eBook or a SlideShare and that’s the thing you want to try as your kind of cornerstone piece of content. That doesn’t mean that it’s even necessarily the biggest traffic driver, but that’s the big piece that you’re going to extract the little pieces from. You might start there or sometimes what’s happened on our front at Convince & Convert is that we’ve noticed a blog post, just a regular blog post just kind of go viral in our sense and we didn’t expect that. So that tells us, “Okay, that’s the other way.” So there’s the push method and the pull method. That’s the method where we said we were just writing about what we wanted to write about, but this actually resonated with our audience. That’s the thing that we should take this quarter, instead of the other thing that we had planned to do. Our audience is telling us they want this and they want more of this. So we have to listen to them. That’s also why you kind of have to be flexible. If that one goes well and that one skyrockets, then that’s the one you should be doing interviews around. That’s the one that you should be creating pull quotes and graphics and case studies and whatever else you can around it. Sometimes you can’t predict that. Kate: Isn’t that so funny? I feel like that happens to so many people, whether it’s posts or just different creative work they do. They just throw something out there and they think it’s not going to get traction. And the brilliant piece of work they did they spent hours on that they think is going to be this huge success doesn’t get any traction and it’s one thing they kind of throw up that’s amazing. I think it’s funny how people are a little bit scared to just try doing stuff, taking action. Jess: It feels like a big commitment. That’s what I feel like we don’t talk about enough, that content doesn’t have to be that hard. If you put your thought into it and you put your ideas into it and the ideas are good, people are going to consume it and share it. If it’s not, well then okay, move on. It doesn’t have to be seen as this big win or this big failure. That’s the beauty and that’s also the problem with content is that everything is moving so quickly. One of the things I remember from a few years ago was Marketo’s big marketing coloring book, which at that point, I think it came out in 2012 or 2013 or something. At that point, nobody was doing anything like that. No B2B marketing company was doing anything like that. They came out with this thing. I still think about it because they were kind of a trailblazer at that time, but think of how many companies actually are the trailblazers. You can’t plan to do that, I don’t think. You kind of have to try things and try to be a trailblazer for sure, but don’t feel bad about yourself if you don’t create the thing that changes the face of content marketing forever. The chances of that happening are very low. Kate: That’s such a great point. The more stuff that you put out, that’s the only way you’re going to know. Like you said with Convince & Convert, you have to just put things out. Some stuff works, some doesn’t. It’s not a failure, but you have to try and just start to continue to put that stuff out. So going back a little bit to planning with any kind of content calendar, do you suggest people have at least a set thing, just to see if it does gain traction, like they’re going to do that one video a week for just a couple months to see if they get anything with that? What happens then and I’ve seen this over and over is you get this content paralysis where you’re like, “I haven’t posted in a month, so the next thing I have to post has to be amazing, otherwise I might as well not post at all.” And then another month goes by and then the next thing you know, you haven’t posted anything in six months. I think that’s also that yeah, having confidence in what you know, but also just there is a lot to be said for consistency. I think there’s a certain level. We’ve noticed on Convince & Convert going from four posts at one point to eight posts, we doubled the traffic on the site. Jess: Yes, it was double the work and yes, it was double everything, but that was worth it because we wanted to double the traffic. But then I think if we went from 8 to 10 posts to 20 posts, that wouldn’t double. There is a critical mass where you’re going to get to that. I don’t think you should just be creating more for more’s sake. But it’s been proven that up to a certain point, the more often you post content, the more people are going to engage. Jess: It’s just a visibility thing at some point. But also, they start to trust you and they start to feel like they want to come and see what your content is because you’re doing a great job in a perfect world. Kate: Yeah. So you just need to create good content and be consistent. That’s it, people. Jess: That’s it. Signing off. Kate: That’s it. You’re welcome. Jess: Simple. That’s why I struggle with some of this sometimes because a lot of people say the same thing, but I think people don’t internalize what that means. What I’m saying right now isn’t necessarily new information, but it’s very much overlooked in the space. People think, “I’m publishing all this stuff. Why isn’t my traffic going up? My traffic is going down.” Okay. That’s a problem. I’ve seen that time and time again, or I’m losing Twitter followers. People are not going to put up with crap anymore. They’re just not. There’s too much good stuff in there. It’s the attention economy. So whatever you can do to get people to pay attention to you, it has to be good now. It’s not just these little memes or these funny things, it has to be useful to me, otherwise I’m not going to pay attention. Kate: Yeah. Absolutely. I frequently reference Jay’s book, “Youtility,” just because he does have so many great examples of how companies were able to produce content that is useful because I think a lot of companies, it’s hard for them to come up with a really creative idea on the content side that is going to be helpful, that could potentially get shared a lot around the web. So do you have any apps or tools that you just can’t live without or you think would be really helpful for anybody that’s creating content? Jess: Yeah. So we started using CoSchedule at Convince & Convert probably about two years ago now. Before that, it was a mess. Nothing beats Excel, I will say that. Spreadsheets are great and there’s absolutely nothing wrong with that. For me, I wanted a tool that integrated with our CMS. We used WordPress. So we use the CoSchedule plugin. CoSchedule also works as a standalone tool. You don’t have to use it with WordPress, but for me, I needed to be working. I was in WordPress and I needed to be working in WordPress. So as we started creating more content, I started freaking out because I was like, “I already don’t know how to manage all this really well in an integrated way.” CoSchedule kind of came to the rescue. The other reason why I love it, just for strict calendar functionality, it’s great. If you use it for nothing else and you’re posting once a day or multiple times a day, it’s amazing for that. But the other thing that we’ve now been using it for is the workflow management. So with all this content, as you can imagine, I can’t do it by myself. I still choose everything that goes out there. I oversee everything that goes out on Convince & Convert Media. But I need some help with the production, creating images, making sure that the posts are formatted correctly in our style guide. To have the tool to say, “Okay, this post is approved, next step, let’s get it loaded up and formatted.” Next step, let’s get the title analyzed and let’s choose a good title and a good keyword. Next step, okay, the title is approved. Let’s get a graphic in there.” There are literally tasks in CoSchedule that you can assign to yourself or to your colleague or whoever is working on the content with you and make sure you’re just ticking things off, going down the list. For me, that was a huge time saver. Kate: Did they give you anything with the title? Like did they give suggestions or anything within that platform? Jess: They do. They do have a headline analyzer tool. It’s not perfect. It’s not the only one we use. And it’s not the best one because it doesn’t show the search volume and things like that. There are some other tools that we’ve used, like InboundWriter was one of them that recently went away. But there are a couple of different tools like that that you can use to analyze your headlines. But even I think that the whole idea of headlines and keywords actually has to come back further to your idea, your strategy and your ideas where you’re going to be a thought leader. I’m not an SEO expert, so I don’t even want to go there. But because I know what our core competencies are at Convince & Convert, I can guide the keyword strategy just from that. We do have some SEO experts that we also consult with to help us figure out where our audience is. The reality with Convince & Convert that’s interesting is that 50% of our traffic is organic. So keywords actually are really, really important to us. They might be less important to people that don’t get as much organic search volume. But we are trying to cater to what digital marketing people, whether they’re managers or executives or even coordinator people, we’re trying to cater to the things that they’re looking for. We’re trying to kind of hit the trends before they’re trends sometimes, which is really impossible. But just with the volume of content that we have and the amount of different experts that we have, not just Jay and the Convince & Convert team, but all the guest bloggers that write for us are high level experts on a lot of things. So their ideas are really important to us because they’re the trailblazers and they’re the thought leaders and they’re predicting what the next trends will be. So we kind of got on a tangent. Jess: So visual, we definitely use Canva a hell of a lot. Kate: I use it every single day, oh my gosh. Jess: It’s one of the best things out there for a non-graphic designer. I’m not very good at graphics at all. But even I can make a decent looking graphic with Canva, imagine that. Canva is great. There are a lot of newer stock photo sites that you can use. Buffer has one now called Pablo. There are a bunch of different image sourcing sites that are really great. There’s also always Flickr Creative Commons. People are trying to find more images that don’t look so generic. Unsplash is another good one, where they have these beautiful, high resolution images that you can then overlay text with or whatever you want to do. It’s not like the token people sitting in a room in front of a computer stock image. So that’s always good. Kate: Those are starting to look so cheesy now. Jess: The older ones were a lot cheesier. Those clip-art looking ones… At least most people aren’t doing that as much as they did. It seems like it’s not only about the actual visual, like does it need to be a nice-looking picture, but what I can put out to my audience that they can consume quickly. So that’s why a lot of people are putting the headline or quote or something on top of their graphic because they want to say, “Okay, if you look at nothing else in this blog post or in this video or whatever, here’s this pretty hero image that basically tells you what you need to know. If you want to know more about it, keep reading,” but a lot of people just read the headline or move on or even share it without reading the article, which is hilarious. Kate: Yes. That does seem to happen. Okay. So we have a couple minutes. I just wanted to talk about podcasting because I know that it seems like a lot more people are jumping on the bandwagon to create a podcast. What are your thoughts around this platform? Jess: Podcasting is such a unique way to get in front of new audiences because some people, it’s kind of like the older days of blogs, where people would just browse blogs. I don’t find that people really do that anymore. People have their readers that they populate with the blogs that they like to read, but it’s not like, “Hey, what blog are you reading these days?” It’s like every site is more like a magazine now than a personal account of a life or even a certain trend. Most of the people that are thought leaders now, especially in digital marketing, are not the only ones creating content on their blogs anymore. It’s common that the people who are reading these blogs don’t necessarily want to read anyone else’s writing except for the writing that Jay Baer does. So they’ll follow Jay and whenever he publishes something, it might be on Forbes. It might be on Convince & Convert. It might be on Medium. But they’ll read what he wrote, but that doesn’t mean that they’ve bookmarked ConvinceAndConvert.com even though Jay writes there every week. Whereas on the podcasting side, people are still doing that thing where they browse. They browse by category or they see a new and noteworthy thing pop up and they click on it and they listen to it. To me these days, it seems to be a much better discovery engine than blogs and written content is now. The other thing I really like about it and going back to the content creation to build trust and reputation is that I think when people hear you in their ears, that automatically builds up a certain level of trust and kind of breaks down that wall and that barrier between you. Again, not everybody is great on any verbal or video communication. So it’s definitely not for everybody. But I would say if you’re passionate about something or you feel like you’re a thought leader in a certain subject or a niche part of an industry or anything like that, I highly recommend trying that route. A lot of people do interview shows. You don’t have to do that. You could just sit in front of the microphone and talk for 5, 10, 15 minutes and see where that gets you. But there’s not a lot out there right now. I would say Snapchat is another way that people are using the discovery feature a lot. But it’s kind of similar because it’s just another lens into people’s lives and into that way that they want to know you more. They want to know the person, not the business behind the person. Even big companies, Salesforce, I just have them top of mind because we’re working with them a lot, but that’s a huge company. But to have their Salesforce Cloudcast podcast, which is two people, two of the Salesforce employees, but still, you get a feel for their personalities and what they really care about. It humanizes a bigger company in a way that no written content can do what podcasting can do. Kate: Yeah. In fact, I think it’s funny. When you listen to someone’s podcast and then you read their book, you hear them talking about it. Jess: You start to hear them. Yeah, totally. Kate: In fact, when I get someone’s book and it’s not read by them, I get a little upset about it because I’m thinking I want to hear them. I’m used to their voice and the way they talk about it. Kate: All right. Cool. Well, Jess, this is so awesome. I wrote down so many fun little tips because you just gave away so much great information about content creation and the process behind it. So I hope everyone enjoyed the show. But before we go, we’re going to do a little bonus round to get to know you a little bit. So I’m going to ask you three questions that I actually am going to be asking each one of the Convince & Convert team members. So the first one is what is your marketing superpower? Jess: Well, it’s funny. I went to college for marketing, but I didn’t actually do marketing for a little while after that. So sometimes I’m like, “Am I really in marketing?” But I would say, and this is not just a marketing superpower, but I think one of my biggest superpowers is taking these big scary ideas and plans and strategies and distilling them down into action items and realistic plans. So some people have these pie in the sky ideas. I love that. Some people get terrified by that. I love when people have that. But then I like to go back and say, “Okay, what is your first priority, second priority, third priority. We can’t do all of this at once.” It’s always a resources thing too. I know we didn’t talk too much about that. But resources and content in any kind of marketing are really, really important to know before you even do the strategy and put the plan in place. If you don’t have the resources to execute it, it doesn’t matter what you want to plan. But I think my superpower would be taking those big, bold, brilliant ideas and distilling them down into primary, secondary, tertiary goals and making them into literal to-do items, not just like, “Launch a website in three months.” Every single day, every single week, what are the actual to-do items that are associated with that? Kate: Awesome. What digital marketing trend are you most excited about? Jess: I’ve been seeing a few of our mutual friends, I’m sure, posting about how sort of what we were talking about a little bit. People get really excited about platforms. I just don’t. I’ve seen so many come and go that I’m like I can never get attached to any of them because who knows what’s going to happen. I’m not particularly excited about any one platform right now, but I am excited about more people getting more focused. Maybe this isn’t quite a trend yet, but it seemed like there was a time where in the content shock vein, everyone was trying to do everything all the time. Unless you have a huge ginormous team and you’ve got all the great ideas in the world and all the time and all the bandwidth to do that, that’s not going to work. So people seem to be focusing a little more narrowly on who their niche is. It’s less about the number of people you have in your audience and more about who they are and how engaged they are and how influential they are. So I’m excited about that because I think more people are going to be able to make a bigger impact with a smaller, more dedicated group as opposed to broadcasting their message to everyone all the time. Kate: Awesome. I agree. And if you could only have one mobile app and use it on your phone, what would it be? Jess: If it was work-related, I would probably have to say my calendar. I use Sunrise as my calendar. I have so many different accounts that if I didn’t have my calendar I would probably melt away somewhere. But if it was just for like connectivity and keeping up with friends and I don’t think I would have said this even a month ago or two months ago, but right now Snapchat is one of my favorite ways to connect with people and keep in touch with what people’s lives are. I think it’s still sort of untainted, if you will. People are still being really raw and honest on that platform as opposed to some of the other ones have just gotten too professional and too nasty, whatever. I don’t know. But a lot of people that I follow on other networks aren’t as honest and real as they are on Snapchat. So I feel like I really can get that connection through Snapchat. I’m not a 14-year girl, so it’s weird saying that. Adults can use it too. Kate: It’s true. It’s funny. I have a friend of mine who would not text me anymore. He would just not until, “You can see everything I’m doing and I’ll message you on Snapchat.” And I was not on Snapchat. Jess: It’s taking over. Some people have this as a vehicle of choice. I notice that with some clients. It’s crazy. I never thought that would happen. I usually don’t have any notifications on on my phone. I don’t like to be bothered. I like to look at when I want to look at it, but I turned on Snapchat notifications because I was starting to get them from important people. And then once I realized what was going on there, I realized this is really cool. You can have that more personal relationship with a friend or a colleague or a client. Sometimes you have to be a little careful on that front because you don’t want to go too crazy. I’ve seen some weird stuff. But for the most part, it’s just a nice way to get another glimpse into people’s lives and to feel more connected to them. Kate: Awesome. Everyone needs to connect with you on Snapchat. Jess: Well, I don’t think my snaps are good, but okay. Kate: People can see for themselves and go from there. Kate: Well, Jess, thank you so much. It was such a pleasure chatting with you. I look forward to meeting with everyone else on your team. So thank you for being here and talking all about ways to create content with minimal hassles!